EU campaigners make fool of themselves with BUS CRASH! Pro European Union campaigners launched a new campaign bus, which immediately got stuck in a narrow Westminster street. 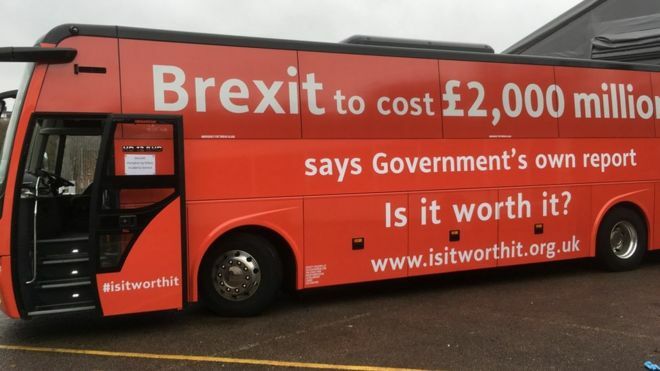 Playing on the bus that promised an extra £350m for the NHS, the pro-European Union red bus states: "Brexit to cost £2,000million a week... says the government's own report". The driver was seen trying to squeeze down a tight road in Westminster as it tried to get to College Green for a photo opportunity. In other news the bus has been banned from parking in Oxford! Campaigners had wanted to park outside Balliol College in Oxford, which counts Foreign Secretary Boris Johnson - who campaigned for Britain to leave the EU. The bus tour started with stops in London earlier and is visiting towns and cities across the UK until 28 February.